I'm planning to use an ESP module outside for environment measures (temperature, humidity, spped wind..) and so would like to power it in Solar mode. I have a solar panel giving 6V/3W at best. I have a little TP4056 module to charge 18650 battery with solar panel. Question is: Can I wire in parallel with the output of the charger module on the battery a voltage regulator to power my ESP ? Re: Solar Power Supply for ESP ?? I solar power some of my projects, this is what i do. The solar panel is wired to the 4056 module Vin pads. The battery is wired to the B+ and B- pads. The +V pad is connected to a 3.3V, very low voltage dropout voltage regulator, i use an MCP1700, the output of this powers my system. The -V pad is connected to ground. I have used this method in a load of projects and it works well. Thanks a lot Ray, it's exactly what I'm looking to do but I'm confused about wiring on TP4056. Mine are like below and I don't see a V+/V- pad to power the ESP ! You have a module without protection which is not advised to be used in such project. I wrote a more detailed post but it seems to have vanished into the ether. A couple of other things i do with the TP board. 1. Remove the LED's as they are a total waste of power. 3. Wire the charge status to a spare digital input so you can monitor when the module is charging. 4. Wire the battery output through a potential divider then connect this to an ADC input so you can monitor the battery voltage. Unless yourt detailed looks to be lost thanks for listing the main steps For charge status I can directly wire the connection of the original charging led to an input of ESP no ? Yes, for the charge status, remove LED and wire from the Anode side of LED to a D/I on ESP. I soldered a 5 pin SIL header to the PCB, bent the middle pin 90 degrees and soldered the wire link to the LED from this pin. This way to can unplug the PCB from your main PCB. Regarding the potential divider for the ADC I/P. I cannot find any specifications on the input impedance of the ESP ADC so lets assume it is ~50K. We need to keep the ADC input voltage below say 3.2 volts for a fully charged battery (4.2 volts). Here is a link to a calculator. Keep R1 resistor value <3K. Once this is done measure the battery full V at the ADC input, note it, do the same for the battery min V then use these values to scale the reading the ESP spits out. CAUTION..............because i have NEVER used the ESP ADC i assumed it's Vin range is 0 to 3.3V, according to this link it is 0 to 1V. Tripple check what it is before working out your potential divider. If i get some time today ill check it out on my ESP as i will be using it in the future. ESP8266 ADC pin range is indeed 0-1VDC !! watch carefully!! The input impedance of the ADC WILL vary during use therefore the potential divider network should be kept to sub 10K levels otherwise the input signal will vary a small amount and not give accurate results. This is how i do ADC signal conditioning (for a battery) on a PIC, works a treat and very stable. What value of R1 and R2 do you use for correct measure of 18650 battery then ? so double the values to use less current. DO NOT GO OVER 20K for R1, otherwise you will get inaccuracy s on the ADC readings. Also bear in mind that the ADC input impedance will have an impact to the potential divider "real" output voltage. If the I/P impedance is 50K then you are effectively putting 50K across R2 (parallel), so the measured real value on the ADC will be less. Use the 2 point calibration on the ADC device to NULL out this. Thans a lot for help so looks like I can go with 20k for R1 and 6K for R2 and I should be pretty good no ?? What is 2 point calibration on the ADC input ? Here is a better calculator that lets you enter one of the resistor values. For the calibration take a look at the ADC device, Im not sure how the 2 point cal works as iv not tried it. Normally you will enter the upper V in = 4.3V-ADC count=1023 and the lowest Vin=0V-ADC count=0, the calibration then uses these points to scale the displayed Voltage. 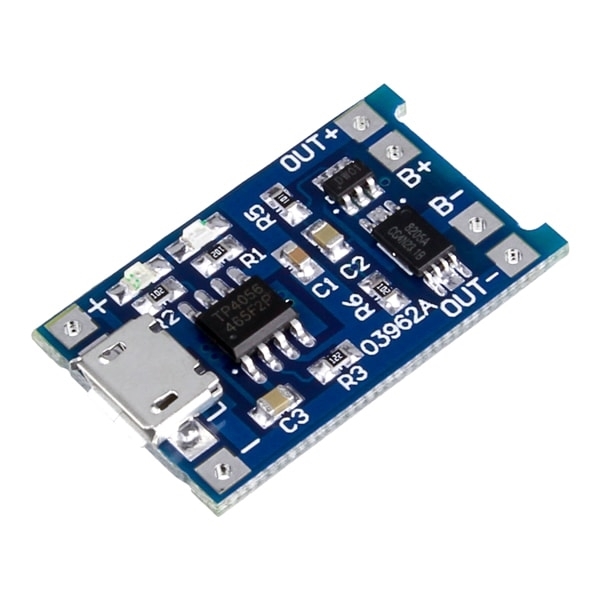 what is the I2C module? DANGER!!!!!!!!!!!!!!!! Where is the voltage regulator? 4.2 volts (a fully charged LiOn) WILL KILL a bare esp module (been there and done that unless your using a PCB with a vreg? Lots of detail missing out of your drawing? Yes i checked your drawing, the TP board has NO VOLTAGE regulation, your drawing will WRECK a bare ESP module when the battery is fully charged. as for an INA board, iv never heard of it and NO IDEA what it is? I checked by putting usb power on board and in fact it gives me nearly always around 4V which is above ESP specs but I intended to plug that power to the USB port of ESP so it should be ok no ? Module I use is exactly the one you indicate !! What do you mean about DVM out ?? Perhaps I misexplained myself but I'm not going to wire TP4056 module directly to ESP but to the USB port of my ESP board so in this case the USB regulator of the ESP board will take care of 4V coming from TP4056 without risk for ESP no ? The USB port of ESP8266? This would be a ESP8266 Development module? Which one are you using? Most modules have a voltage regulator to take 5v down to 3.3. You should check the specs on the voltage regulator (and diode if in the circuit). Generally they use something like a AMS1117, which has a significant voltage drop. These modules are not really ideal for battery operation, with the exception of the Adafruit Feather Huzzah (which has a built in Lipo charging circuit and appropriate voltage regulator) and maybe the Wemos with battery shield (I don't have so can't say for sure). If I remember correctly most Lipo chargers cut off when the battery reaches 4.2V which will never happen unless the charge voltage is more than that. The TP4056 I have runs at 4.12V with no battery, and the 03962A is 2.14v but this may be different with a battery attached. I think you would do better with a bare ESP12F on one of the white adapter boards, with a good voltage regulator and capacitors. It would probably be less expensive as well. If you are looking to do wind speed or rainfall, I think you are looking at something with more power and no deep sleep, maybe just running off 5V. This is how i wire a bare ESP12-E module using solar and TP4056 PCB. Thanks a lot for the share so will use your schema to build my one Is it well 0.1uF or 0.1nF capacitor ? 0.1uF (or 100nF) both are the same value. Are you powering nodemcu modules or single esp8266 chips? Do you have issues with the panels output being over 6v and frying the MCP1700 ? Is there anyone knowing the max17043 / max17044? If not, it is a fuel-gauge chip for lithium-ion batteries and it looks like it's absolutely suitable for solar powered projects. I guess it could determine the lipo's fuel very precise and seems to have a very small active current (50uA) and a sleep current with 1uA. Looks for me like it is perfect. But I'm wondering that I can't find harly battery driven projects using it. Are there reasons for that? Is it not good enouth? Anybody experience with it? It looks really interesting. I have never seen it. Most of the solar circuits I have seen are as low cost (and low piwer) as possible. It would require a plugin for the battery level feature. For me it is not great because I would have to use a breakout. The chip package looks like it would need an oven to solder and I am not there yet. There is another chip (also for solar MCP73871) I think would improve efficiency, but it is a qfn package and so far I have not needed it. With a small 6v solar panel, 18650 battery and simple charging circuit I have been able to keep an esp going on 10 minute deep sleep for several months. I may have to re-evalvuate after the winter, but no problems (except for sensor issues) so far. Higher efficency is great, but it is probably far cheaper to increase the solal panel size if needed. Would you mind to share rules you used to get correct value of battery through resistors once wired to ADC input of ESP ?